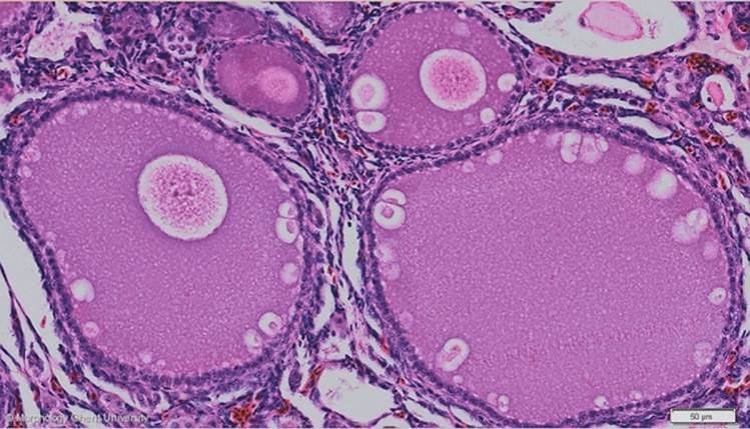 In young oocytes, initially a dark diffuse spot can be seen in the ovoplasm near the nucleus. This spot is called the Balbiani body, a concentration of cell organelles (mitochondria, ER, golgi apparatus and centrioles) and macromolecules. As the ovum develops, fat droplets accumulate in the Balbiani body what causes it to break up and spread throughout the ovoplasm. At the same time, the disintegration of yolk into yolk spheres starts at the periphery of the ovum.